MT6592 is the latest chipset from MediaTek . 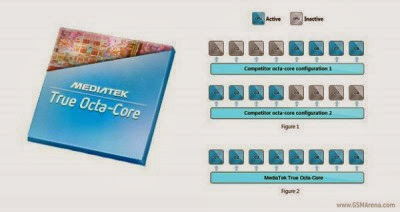 MediaTek MT6592 processor said to be true for the octa - core mobile platform . What are the advantages of the latest chipsets from MediaTek this ?Latest processor from MediaTek is claimed to provide a premium gaming experience , multi - tasking capabilities are qualified, and the performance is more optimal web browsing . So as to provide a more capable performance on high-end smartphones and tablets . This chipset is built on 28nm architecture , where each of the eight core processors have speeds up to 2GHz , as reported by GSMArena . MediaTek algorithm scheduling capabilities will monitor the temperature and power consumption to ensure SoC chipset delivers optimal performance . In addition to the multimedia subsystem , with quad - core graphics and video playback system capable of supporting 4K Ultra - HD playphone . This chipset also supports cameras up to 16 megapixels and FullHD screen .